Gwyneth Paltrow wants you to know that she's a cool mum, not a regular mum. From the classics to required reading in high school, Olympia Le-Tan's unique clutches have become a must-have accessory. Who doesn't love an accessory that begs you with eponymous charm to clutch it close. We're crazy for clutches this summer, here are some of our favorites. 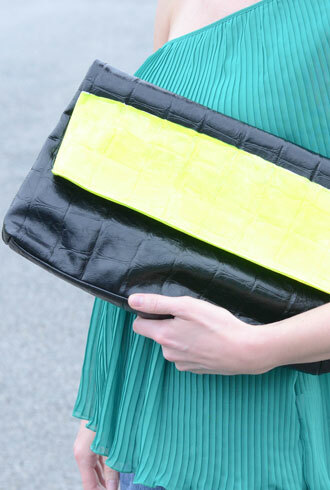 From Clare Vivier to Rebecca Minkoff, it feels like neon is everywhere this season. And if you don't feel like shelling out a lot of money for a funky trend, you can paint yourself an on-trend neon clutch with just a few supplies. Glitterize a designer-inspired clutch for the holidays with this super easy DIY project. Take the plunge, leave your satchel at home and opt for one of these great clutches for day. Inspired by the Fall 2011 runways, we give the day clutch a test in the real world.